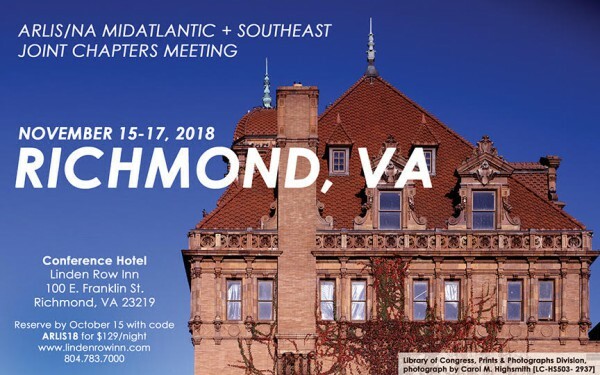 The ARLIS/NA Mid-Atlantic and Southeast Chapters are hosting a joint Fall 2018 chapter meeting on Thursday, November 15 to Saturday, November 17 in Richmond, Virginia. Business meetings will be held on Friday, November 16 with additional activities and presentations happening over the course of the weekend. While the full schedule and registration details are not yet finalized, Virginia Commonwealth University will serve as host for many of the activities. Organizing a successful meeting between chapters across so many states is a true collaborative effort. If you’re interested in volunteering to help with local arrangements, support on-site registration and logistics, and coordinating a presentation and poster session, please fill out this volunteer form by Friday, August 3. The conference hotel is the Linden Row Inn, located in the Monroe Ward district of downtown Richmond. Reserve your room by October 15 using the code ARLIS18 to receive our group rate of $129/night. To help you plan your travel in advance, Southeast chapter meetings usually start informally on Thursday evenings with dinner, and maybe a walking tour. Saturdays are usually reserved for presentations or additional tours, and tend to wrap up mid-afternoon. If you’re planning to travel by Amtrak, there are two daily trains in and out of Richmond and round-trip travel is currently $56 out of Washington, D.C. Union Station. As more details are finalized, they will be posted to this page. Vacancy Announcement: Student Assistant – National Gallery of Art, Washington, D.C.